Rev. Fr. Daniel Thomas is the son of the late Mr. M. M. Daniel and Annamma Daniel of Munjanattu, Kozhencherry, Kerala. Rev. Fr. Daniel Thomas studied at Union Christian College, Aluva, Kerala India and earned a B.A. degree in Philosophy and Psychology. 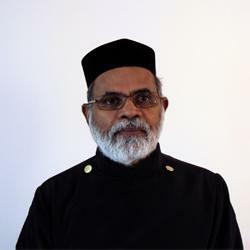 He studied Theology at Leonard Theological College, Jabalpur, Madhya Pradesh India and earned B.D. degree from Serampore College, Serampore, District Hooghly West Bengal. He got a scholarship in 1965 to study at Andover Newton Theological School, Newton Centre, MA USA and Center for the Study of World Religions, Harvard Divinity School, Cambridge, MA USA and earned a M.A. degree in Religions. In 1966, he got a fellowship af McMaster University Hamilton, Ontario Canada and earned a M.A and Ph.D. in Indian Philosophy. Fr. Thomas served as the executive officer responsible for Research and publication at Christian Institute for the Study of Religion and Society, Bangalore India. He also served as Assistant professor of Philosophy and religious Studies at Mount Allison University, Sackville, New Brunswick Canada. In July of 1972, he was appointed as Professor and the Head of the Department of Philosophy and Religious Studies at Cégep Vanier College, Montréal, Québec Canada. He also served on the advisory board of the education Department of the Quebec Government representing the College. He has published several papers in International journals. Books published are listed below. He was ordained as Apodyaqno by His Grace Philippose Mar Eusebius on July 22nd, 1995. On Thursday July 27th, 1995, H.G. Philippose Mar Eusebius ordained him as Shamosho. His Holiness Moran Mar Baseliose Marthoma Mathews II, the Catholicose, ordained him as Kassiso at St. Mathews' Orthodox Church, Kozhencherry, Kerala India on July 29th, 1995. Married to Sosamma , the daughter of Mr.Ittoop and Annamma of Chakkanakuzhile, Kolencherry. They have two children, Priya and Pran.